Apple this past week released a new version of FCP X (version 10.4.4). One of the new headline features of the release was inbuilt noise reduction. 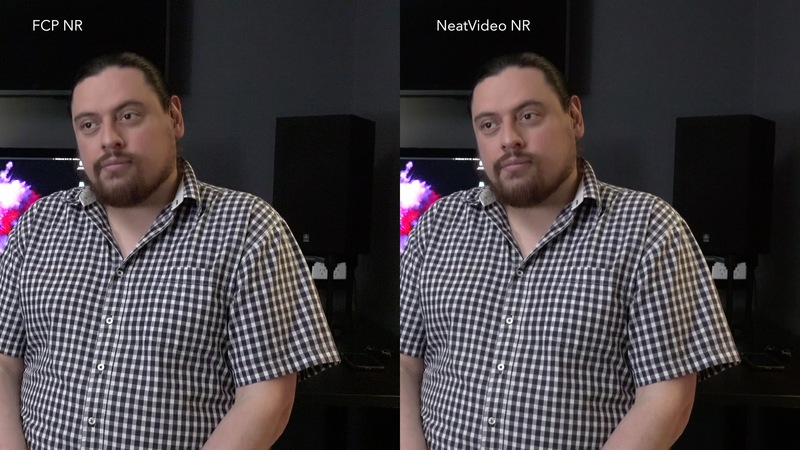 Having purchased NeatVideo’s noise reduction filter some years ago (and upgraded to the latest version when it was released) I was keen to see how Apple’s version compared with the paid plug-in from NeatVideo. This is a very quick and dirty test, but hopefully gives a sense of the difference between the two. I grabbed three different cameras that I feel are typical of “run and gun” style cameras. The type of person who might use these cameras is also likely to run into situations where they have noisy video because of low light. Typically these would be wedding or event videographers. We’d like more light, but sometimes it just isn’t there and we have to rely on gain/high ISOs to help out. 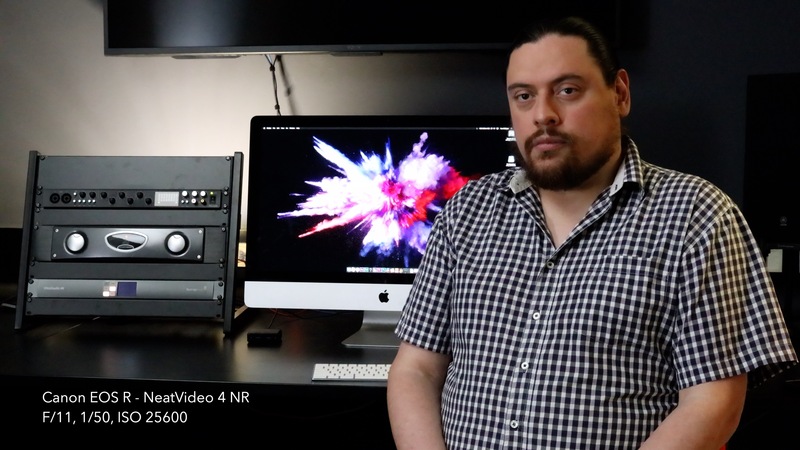 All video was shot in 4k (UHD). I set up the cameras in a dim studio which has a reasonable amount of flat colour (so the noise shows more clearly). The colours are darker which also shows more noise. I simulated a darker environment by killing most of the light and stopping down my aperture. I exposed each camera correctly for each ISO I wanted to test. 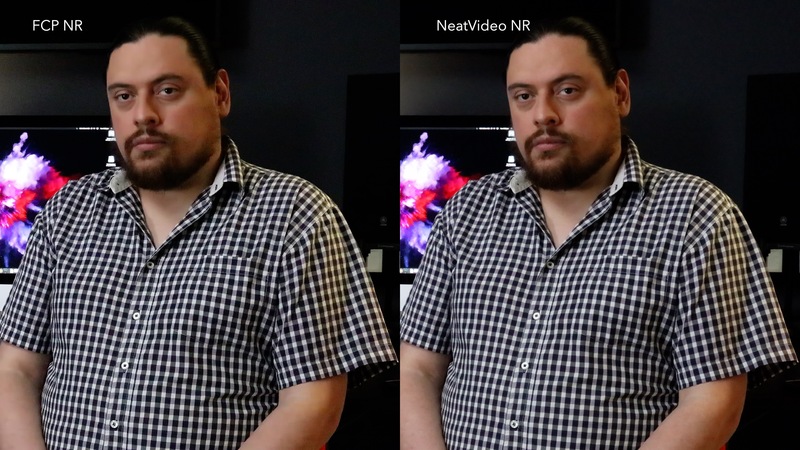 Please note that this test isn’t trying to compare cameras in any way, just generate different noise patterns for FCP X and NeatVideo to work with. The footage is straight out of camera with no modification. The only exception is the GH5 which we had in V-Log so that has the standard Panasonic LUT applied. The other cameras can shoot in log modes, but I wanted to see something closer to typical video. 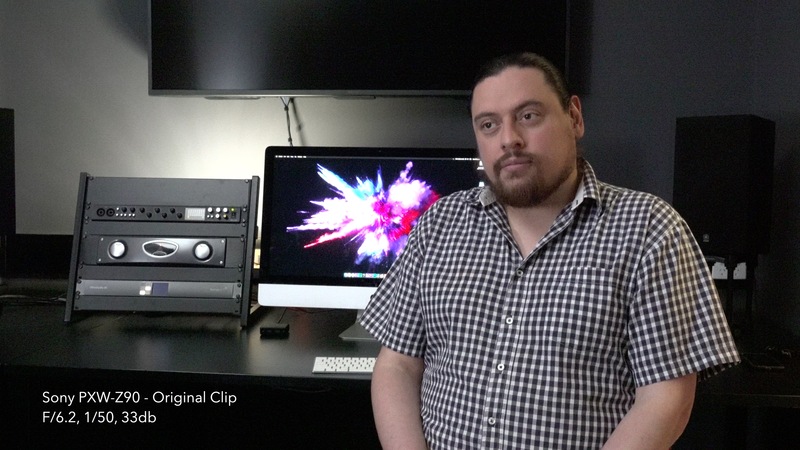 The video shows the original footage, then FCP X’s noise reduction filter, then NeatVideo’s. 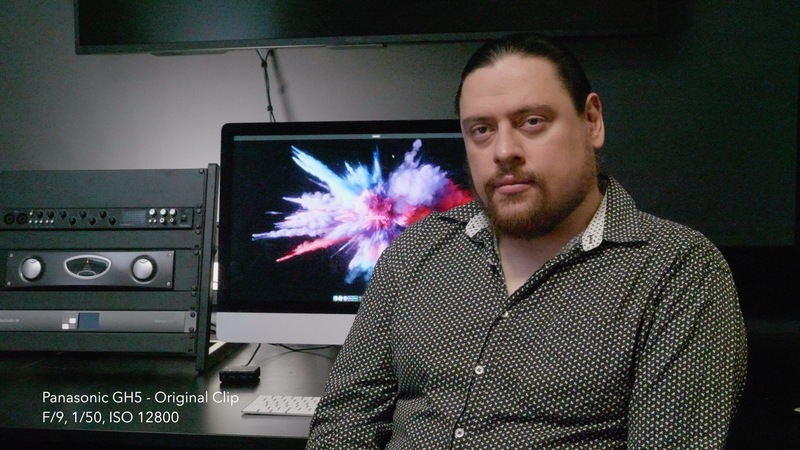 The FCP X filter doesn’t have a heap of control. I set it to Maximum noise reduction with low sharpening. High setting works ok on some shots, but max seemed to a do a better job for most of them. Device Tab: >85% Profile Quality on all shots (most I got over 95% after auto profile and auto fine tune). I’m guessing as I write this that YouTube will kill a bit of the result with it’s compression, however hopefully it’s pretty clear: NeatVideo does a much nicer job than the built in tool. Hopefully this is to be expected considering one comes with FCP X and one costs over a hundred bucks, however the difference was perhaps more than I expected. Interestingly the FCP X NR seemed to work best with “medium” levels of noise. There is one other part to this though: speed to render. Those who’ve used NeatVideo in the past will know it does a nice job of killing noise, but it also does a nice job of killing your CPU/GPU (translation: it’s slow). The settings I used for NeatVideo, while not the slowest, will bring your machine to a crawl. Since the plug-in does give you more control, I did want to exercise some of it. The built in plug-in is roughly 12.9x faster. If you just want a quick clean up the built in NR might be the way to go. To test the difference, I deleted all render files and then timed an export of just the NeatVideo clips and just the FCP X NR clips. Again, I did crank the quality of NeatVideo, so it would be much faster using the defaults. However if you’re going to use something that has the option have have better quality over what’s built in, you might as well utilise it. This was on an (admittedly older) Late 2017 5k iMac with an i7 4Ghz CPU, 32GB RAM and a Radeon R9 4GB. NeatVideo had GPU acceleration turned on. 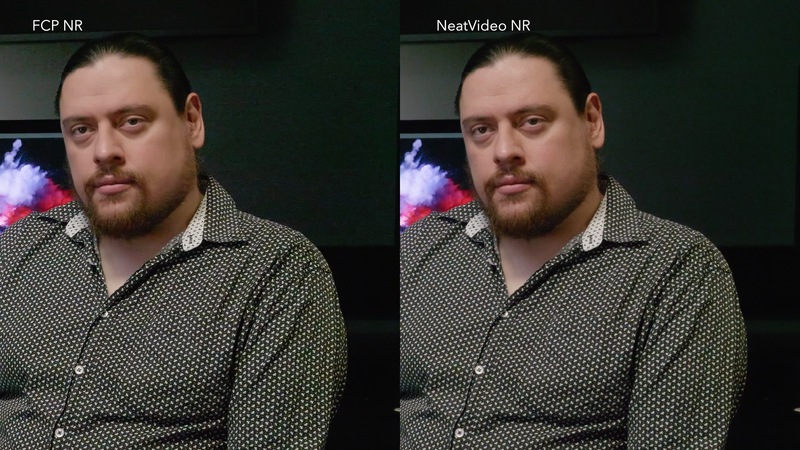 Again, this was a bit of an unscientific test, mostly to full-fill my curiosity, however hopefully it’s useful to others wondering if it’s worth spending the extra money on NeatVideo. If you do a lot of work in low light, it is.